Today Margaret of Scotland takes on John Cassian and we hear two accounts of relics as they both seek to get “a head” to the next round. The Quirks & Quotes continue with the winner facing Enmegahbowh next week. In a spirited and emotional battle, Dietrich Bonhoeffer defeated Brigid of Kildare yesterday 54% to 46%. This match-up inspired poetic responses from many Lent Madness partisans. Bonhoeffer will face Jerome in the Elate Eight. Check out the updated bracket to see how things stand heading into tomorrow’s match-up between Emma of Hawaii and Paul of Tarsus. Margaret of Scotland (1045? – 1093) was a Saxon princess, great-granddaughter of Ethelred the Unready, perhaps born in Hungary and certainly raised there before returning to England as a young girl. She arrived in Scotland by accident, shipwrecked in the Firth of Forth during flight from England back to Hungary after the Norman invasion of 1066. There she caught the eye of King Malcolm III, who convinced her to marry him despite her desire to become a nun. Malcolm had come to the Scottish throne after killing MacBeth, who some years before had killed Malcolm’s father Duncan, which you may have read about in high school. Margaret and Malcolm had eight children. Perhaps not surprisingly, Margaret needed a place of her own to go and pray, and she found a cave outside the castle in Dumfermline for that purpose. Her frequent nocturnal visits to the cave aroused suspicion that she was meeting someone there and plotting against her husband; legend has it that Malcolm followed her one night, only to discover her deep in prayer, beseeching God to enter Malcolm’s heart. Oops. Turgot also told of her beautiful book of Gospels with a jeweled cover. One day, the book fell into a river; it was found later, perfect, with no water damage. The book now resides in the Bodleian Library at Oxford. Ever desiring to assist people of all sorts, she also established a ferry system to take pilgrims to and from St. Andrews church in Fife to visit the relics of the apostle Andrew there. Speaking of relics, when Margaret died, she was buried in Dumfermline. Two hundred years later, after she was canonized, her relics were translated to a new shrine nearby. During the Scottish Reformation, her head was given to Mary Queen of Scots, while the rest of her relics were acquired by Philip II of Spain. Philip apparently placed the relics in a special urn in a special place, and they were never found again. Meanwhile, when Mary died, Margaret’s head was secured by some French Jesuits, but like many other heads, it was lost during the French Revolution. Many Christians celebrate the feast of John Cassian on February 29 — what’s generally known as Leap Year. This happens only once every four years (including last month) so people often transfer his feast to another date. John Cassian’s relics are kept in an underground chapel in the Monastery of St. Victor in Marseilles. While his head and right hand are in the main church, there’s no word on the whereabouts of his left hand. Theologically, Cassian would later be identified with the semipelagians, emphasising the place of free will in the first step to salvation – without the need for God’s grace to initiate that. His is a middleway between Augustine and Pelagius and, while never canonized by the Rome, the Orthodox view Cassian as fully orthodox. In Cassian’s Institutes (De Coenobiorum Institutis, 420-429 AD), he devotes a book to each of the eight, what he terms, “principle faults.” It was Pope Gregory I who combined acedia with sadness as part of developing the idea of the “seven deadly sins” that are more commonly known today. 67 Comments to "Margaret of Scotland vs. John Cassian"
Being a member of St. Margaret’s & San Francisco de Asis in Miami Lakes, FL I have to vote for Maragaret. Feed the poor vs. do not eat? Go Meg! …and now I am voting for the Celt. See how Lent Madness leads to conversion of heart? I needed to vote for Margaret today, she had a need to help others. She reached out to help others in their needs. Listing the “principle faults” of a person as Cassian did never helped them to connect with God or gave a resource to help them in their daily life. Harry, that occurred in a monastic context and was paired with the pursuit of virtues. People perhaps need to reflect more fully on these saints and not just have quick reactions to the short bios. The seven deadly sins versus the nine hungry orphans-the choice of the house is Margaret. I greatly admire Margaret’s devotion to the poor and needy but feel compelled to vote for Cassian because he worked on the removing of the beam in the individual’, a definite need when wanting to help others. Surely of all the Anglican Religious there must have been at least one holy person — and yet we always look to Rome or to the East. Enough already! Let it be Margaret. If you mean the [Anglican] Society of St Margaret, founded by John Mason Neale in 1855 (and of which I’ve long been an Associate), we are St Margaret of Antioch, not of Scotland. But I can happily trade one Margaret for another, even though I greatly admire some of Cassian’s writings. Hi Victor! Glad to hear from you!! You know me! Sr. Brigid!! Are you the M.W. that my wife and used to know at CHS? If it were not Lent, it would be Margaret. But it is, so it’s John. I am stunned by the elegance and eloquence of John Cassian. “Semipelagian”??? Is that like a semi-vegetarian? John Cassian for me – I hear echoes of what will inspire the Rule of St. Benedict – the bedrock of Western monasticism in the advice to make the regimen fit the individual. And don’t forget – those of you trying to vote for Celts – that Margaret is not Celtic, but apparently Hungarian. Which reminds me of a lyric from “My Fair Lady” that occurs during the ballroom scene: “I can tell that she was born Hungarian”! Did she ever lose her accent? Celt or not, Margaret gets my vote. Actually, Margaret was Saxon (i.e., what became English) – her family was in exile in Hungary during her earliest childhood so she spent some years there before returning to England. After the Norman invasion, she and her mother were trying to return to Hungary to escape the war when they shipwrecked in Scotland. John gained me with his comment about communion. That is exactly what I think. And his comment on friendship – after just reconnecting with an dear friend after 25 years! I’ll vote with Benedict on this one, for Cassian . . . .
Dan is right, the visceral response is not always the best response, BUT, this layman’s “viscera” can’t get past the quote about “emphasising the place of free will in the first step to salvation – without the need for God’s grace to initiate that.” And, good try Sharon, but it’s still Margaret of Scotland (or Hungary or wherever) for me! Joe, I’ve seen your posts before, but haven’t had time to mention that my paternal grandmother was a Stroud, by way of Missouri. Perhaps we’re related? I don’t see that name often. Here remains may be scattered, but her legacy is not. Still loved by the Scots (as well as by this descendent) she was a holy woman and provided a great example how power can be used for the good of the people rather than the individual. A choice between one saint who instructs us through her example of humility and charity, and another who instructs us through his brilliant and eloquent thoughts on how to live a Christian life. I vote for Margaret, but I do appreciate the words of Cassian, especially his statement on reception of communion. Carefully thought-out theology, emphasis on prayer, mystic, snubbed by Rome. It’s Cassian for me!! Very difficult choice, as most of them have been! I think I’ll wait for a few more comments before I vote. Any more thoughts on legacy or theology for both of these saints? We do not presume to come to this thy table trusting in our own righteousness…… VOTE CASSIAN!!! 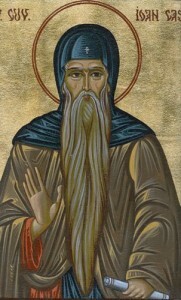 Cassian for me, too; a Desert Father and yes: influential on the development of St. Benedict’s Rule. I believe it’s Cassian’s “Institutes” and “Conferences” that are referred to in Chapter 73 of the Rule: http://www.osb.org/rb/text/rbeaad3.html#73 . I have a weakness for Hungarians. Margaret! Where are all you folks named John? Cassian’s words on communion, simple words that provide stunning insight, should reach through the years and call our hearts to God. No fancy royal trappings or luxuries here, just a simple man with profound thoughts. John…Margaret? John….Margaret? So hard to choose! But at last I confess it has to be Margaret, she too had me at 9 orphans. I was baptized, confirmed and called to ordained ministry at St. Margaret’s, Woodbridge, VA, so St. Margaret it had to be. nutrition is a major concern in today’s society. On John ! and thanks to the Rev. Bosco Peters for clarity in his writing. Now, about the miracle of the jeweled Bible. Hmmm… I can sort of grasp that notion, but not quite. Then, I recalled seeing or being present at a miracle. Hard to explain a miracle as there is no rational explanation, but something unexpected happened: such that the metaphysical & the physical sort of shook hands… You see, words fail me here. You see it. You believe it . It couldn’t happen, but it did. My maternal grandparents were named John and Margaret. I’ll honor my grandmother because she died for the faith. Oh yeah ! I’m with Vicki…where are all you folk named John? Surely you are not deserting the ranks of the faithful to be Margaret-ites….Oh ye of little faith. Well, my long departed half-sainted pater was named John as is my current bishop. There are some Johns I could live without having ever known of their sojourn on planet Earth, but that’s another story for another day. Inquiring minds may well want to know, but daisies never tell, and no, that’s not my name….it just came to mind. On John ! On, Rev. Bosco ! I voted for John. His advice on portion control is one of my favorite guides! And I particularly identify with his thoughts on communion. I love John Cassian’s attentiveness to the variety of human experiences, and psychological and emotional states, in prayer! I’ve never read that before, and am very happy to see the fullness of the human situation addressed. And, I agree, the bit on Communion is wonderful, too…. While Margaret was born in Hungary, her grandfather was one of the last Anglo-Saxon kings. Her father was sent into exile when Canute conquered England. The ethnicity of her mother has been the subject of great debate and is ultimately unknown. Bottom line, she’s not Hungarian or Scottish but (at least partly) English. She had no knowledge of Scottish Gaelic, which is why she insisted on the court language being English, which it apparently thereafter remained. She detested the Celtic Church and strongly worked for its Romanization. She was no friend of the Gaelic Highlanders. As a descendant of Gaelic Highlanders, I’m not a big fan of hers. Sp John Cassian it is. Many Christians could benefit from knowing more about John Cassian’s teachings, which means he definitely needs to advance to the next bracket! Go John! 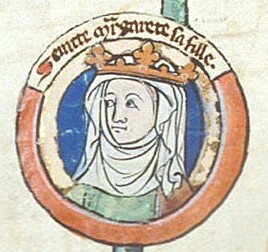 Margaret of Scotland, who lived the sermon rather than preached it. Margaret wanted to be a man?? More info please! I voted for John based on his work and writings, definitely including that quote on receiving communion. But I’m particularly interested in the aspects of women saints that got edited out because they were not useful for policing the gender norms for little girls! “She was poorer than any of her paupers; for they, even when they had nothing, wished to have something; while all her anxiety was to strip herself of what she had.” I’m not sure it is to my credit, but I identify with that. I vote for Margaret. John thinks thinhs through. Margaret lives her heart no matter what beach she gets tossed upon. I have a soft spot for anything regarding Leap Day (not sure why, I wasn’t born then or anything). If Cassian gets shortchanged 3 out of 4 years, that’s tragic! So obviously I am voting for him. Cassion gets my vote. I like his thoughtful style of writing that touches my heart and stirs my soul. Go John! Anyone who can find a middle way between Augustine and Pelagius is truly a saint. Vote for Cassian. I voted for John Cassian because I don’t like how Margaret secured Scotland under Roman authority in the 11th century, when the Scots had their own church, practicing and organized in a different way! Hope spotted the major halo, albeit thin, around Cassian! So he gets the vote tonight at our house. Why would anyone want to walk a middle-road between Augustine and Pelagius? And is being a semi-Pelagian like being semi-pregnant? Two trivial reasons why I voted for Margaret (aka Maggie the Scot): 1) Like her Uncle Eddy (the Confessor) she was a friend of the family; and 2) I happened to be in Edinburgh on the day (4 September 1964) that her nth great granddaughter, Elizabeth II, dedicated the Firth of Forth bridge and St. Margaret’ ferry made its last run after nearly 900 years of service. The serious reasons have already been mentioned above. Re John Cassian: all pre-Reformation Calendars (and Roman and Eastern ones much longer) would have expressed the date as ‘day before the Kalends of March’ i.e Feb 29 in bissextile years and Feb 28 in ordinary years — When he was added to our Calendar (in 2009) Feb 28 was already taken so the 29th it was. Just checked: Elizabeth II is Queen Margaret’s 26 x great granddaughter! And it is through Margaret and her descendant Jame VI/I that the Anglo Saxon line was restored in England 528 years after the Conquest. Thanks for the info, Fr. Bill! Nevertheless, John was a noble saint! Margarent’s life story is fascinatng. The most outstanding action was her consistent charity, especially to the orphans. I vote for Margaret. sort of unsettle me at times. Alas…..John Cassian lost out to the holy relics of the Sainted One. Friendship, not food was his passion. By St. Margaret he’s trounced. From the brackets he’s bounced. As we vote in our Lent Madness fashion. Pretty lame. but the best I can do suffering from LMW.